Why isn’t there software that tracks website visitors perfectly? Such comments are usually the result of someone trialling our A1WebStats software and seeing that there are differences to other software they use. Such differences may work in our favour, or in the favour of the other software. You want to gain more of an understanding of how people interact with the pricing page of your website, and you have a range of software applications at your disposal. So why the differences, whether slight or bigger differences? We investigated one example of this further because we picked up that, having configured Hotjar to pick up on visitors to our pricing page, the results from Hotjar gave us noticeably less visitor numbers than our own software did. Before you think we’re having a bash at Hotjar, that’s not the intention – as you’ll see further on, we encourage use of their software (or that of similar providers). However, what we did see from our own software was much higher visitors who got to the Pricing page, than we could see in the Hotjar data. 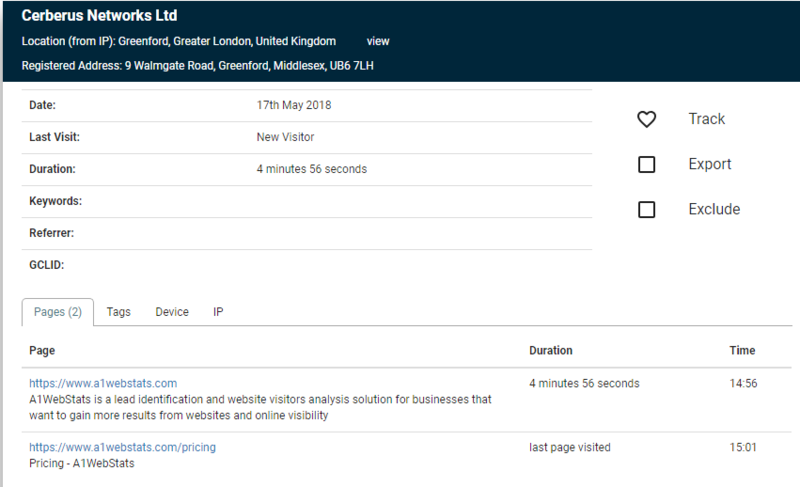 We reached out to Hotjar to try and understand how it was possible for our software to show the visits to the Pricing page, but Hotjar appeared to have gaps in the data. There are many aspects to what Hotjar considers a page-visit. When it comes to recordings it depends on what stage of the users journey they encountered the Hotjar tracking script, if their browser supports websockets, if they stayed on the web page long enough for their session to connect to our servers, if they have certain ad blocking extensions enabled, if the visit matches the recordings page-targeting rules, and many more. As you can see there are many reasons why our page visit statistics may be different to more accurate tools. However, it’s important to note that Hotjar doesn’t try to be 100% accurate when it comes to analytics and it never will be. The purpose of Hotjar is to analyse your users experience on your site, not analyse traffic statistics. In fact, we highly recommend running both Hotjar and analytics software on a site, as together they give a more complete picture of how your site is being used. Most website analytics and user experience tracking software is designed to do a particular job and even then, there are no guarantees of perfection. And that includes our own software. Let’s say that your objective is to closely analyse what happens to visitors who get to page X of your website. Specifically, you want to understand the user journey before they arrive on page X (including what brought them to your website), what happened during their stay on that page, and where they went to after that page. You could use Google Analytics (free) to get a very basic view of traffic related to page X. But Google Analytics won’t let you look at each individual visitor. You could use something like Hotjar to look at heatmapping, scrolling, clicks, and video movements for the people who got to page X. But you wouldn’t get ALL the visitors. You could also use other types of software that would let you gain more insights into those people who got to page X. The overall challenge is that most software has a cost and when you need multiple pieces of software to build up the full picture, you start to need more budget. Why isn’t there one piece of software that does everything at a reasonable price? Believe us, it’s hard enough to create a product that does what A1WebStats does, never mind adding in various other features! Many other software providers would probably say similar about their products. Many of our competitors focus on purely tracking identifiable companies that go to a website. We just happen to believe that analytics should be used in more intelligent ways than purely that. We suspect that people like Hotjar would probably agree, because their software allows deeper insights into the user experience on a website. We are very vocal in our view that while it’s useful to be able to identify companies that go to a website (which we offer as part of A1WebStats), it makes immensely more sense to analyse overall visitor patterns, which leads to strengthening aspects of a website and the marketing that drives traffic to the website. So we want customers who want to go beyond ‘chasing companies’ and instead focus on ‘work out what will help to encourage those companies to make contact more frequently as a result of making positive changes to the website’. So that’s how we position our software. Think of this in a similar way to the evolution of man image below, starting from the left and working rightwards towards full website success. Some businesses do very little with their website visitors data. They are losing out. They’re the first monkey in the image above. Some businesses dabble with a bit of Google Analytics, but can’t gain enough from just that. But they are achieving more than those businesses who are doing nothing, and are therefore a bit more advanced than the first monkey. Some businesses use software such as A1WebStats to see visiting companies AND dig deeper into website visitor patterns. This will benefit them more than those who just chase companies, purely because they’re identifying opportunities to improve. Some businesses use heatmapping and clicks/movement tracking software (e.g. Hotjar) to closely analyse aspects of user experience. It’ll take time investment but will lead to more results because of the granular insights that can be discovered. Some businesses will go further via other methods such as split testing pages, human user experience testing, and more. Yes, more cost and time, but ultimately getting bigger results. These businesses are fully evolved. Let’s say that A1WebStats can show you 100 people who get to page X during a defined time period. However, maybe Hotjar only manages to record 60 of those people who got to page X in that time period. 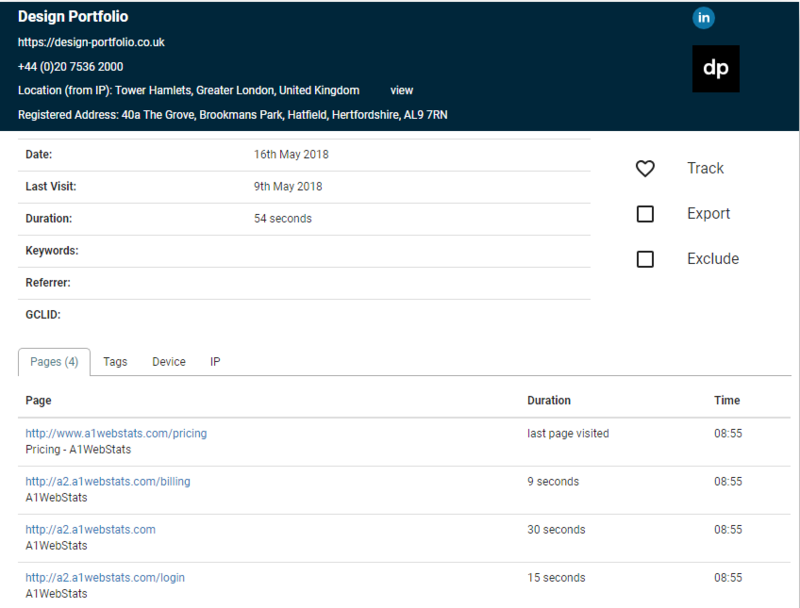 By then working with systems such as Hotjar to look at the 60 people it could track (which is still a statistically useful sample), deeper insights can be gained. So it doesn’t actually matter if Hotjar hasn’t recorded all the visitors, as long as there’s enough to analyse. That is, unless you don’t want to go that deep into analysis and find that A1WebStats data gives you enough information to then make improvements. Our recommendation for all senior management in business, is to start at the end. The end is: the sales of, or enquiries about, a particular product or service. Those sales/enquiries are deducted from all the other people who got to that product or service part of the website, which leaves all the others (which may be 90%+ of all the visitors to that part of the website). Then feel free to chase identifiable companies that got to that product or service page (with the caveat that it’s tough work). Then come back to what matters: all those people (whether identifiable as companies or not), who DIDN’T make contact about the product or service. Finally, choose which software tool or tools you are going to use to dig deeper into the website visitors data related to that product or service. Perhaps start small and no cost (we offer a free 30 day trial of A1WebStats) and utilise that software as much as possible. Then evolve to additional software that would help dig even deeper. No website visitors analysis/user experience software is perfect. Your competitors may be ahead of where you are in using analytics intelligently. Your investment in time and budget for a range of software tools is what’s going to ultimately keep you ahead of your competitors, even though you may see it as a leap of faith.